Joel Barlow High School midfielder Jack Warren, left, makes plenty of things happen from the middle of the pitch. Mitchell Lyons, South Windsor: South Windsor may have ridden its defense but Lyons, a senior striker, has proven to be one of the most dangerous scoring threats in the state. Possessing speed and skill with the ball, Lyons will be looking to light up LL. 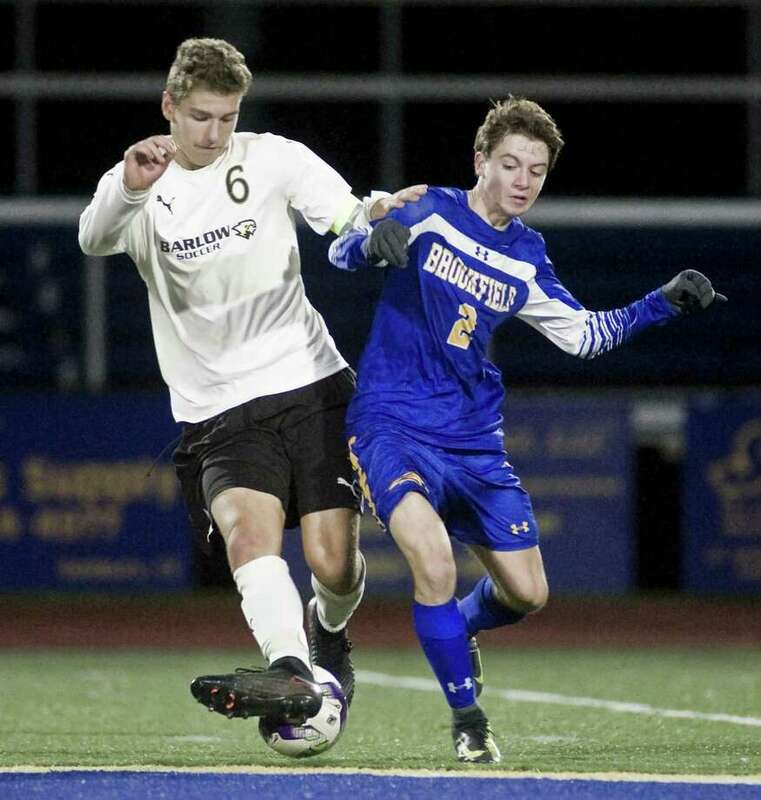 Tyler Warren, Danbury: The Hatters tend to pack it in on defense and in the center of it all is junior centerback Warren. Warren will also venture forward when the opportunity presents itself and can finish from range. Ian Slattery, Guilford: The senior keeper posted eight shutouts this season. He and the defense will be put to the test in a potential second-round matchup with SWC champions Weston. Brennan Hughes, Farmington: Hughes anchored an experienced backline which conceded just seven goals all season. Hughes would love a state title to cap four years on the varsity. Jack Warren, Barlow Midfielder: Warren makes things happen out of the midfield for the Falcons with his ability to build from the back and finish up top. He and the seniors should be hungry for a title in Class L.
A team from the CCC has won a state championship every year since 2012. It should be no surprise that three of the top five seeds in Class LL this season, come from the CCC in No. 2 Hall, No. 4 South Windsor and No. 5 Farmington. Defending LL champion Glastonbury begins its defense as the No. 8 seed, finishing an impressive 11-3-2 in the league this year. One silver lining for those in the bottom half of the draw is the presence of five CCC teams in the top half of the bracket. South Windsor and Farmington both come in with legitimate state title hopes and senior-dominant rosters but could find the other standing in the path to the championship in the quarterfinal round. Hall would not have to see another top team from its league until the title game though No. 19 East Hartford and No. 26 E.O. Smith could advance to meet Hall in later rounds if they can pull upsets early. Along with the firepower out of the CCC, Class LL is packed with quality sides capable of deep runs. None of the top 11 seeds have more than three losses in the regular season. Of course, some of the top seeds will be put to the test right away. No. 1 Xavier is getting rewarded for an unbeaten regular season with the prospect of facing the winner of No. 17 Shelton and No. 16 Greenwich after a bye in Round 1. If the seeds hold in the first round, Glastonbury could face No. 9 Trumbull in a second-round match between teams with five combined losses. If No. 2 Fairfield Prep (14-1-1) and No. 14 Ludlowe (10-4-2) both win, the in-town foes will meet in the second round. Discussing second-round matches could prove futile since any of the lower seeds in LL have a legitimate chance of pulling upsets. Winning once is tough enough. Going back-to-back was impressive. Winning three state tiles in a row would be Herculean. The thing is, Hand has the team good enough to pull it off. The No. 3 Tigers came out of the SCC 12-1-3 and find themselves in the bottom half of the Class L field. Weston, Guilford and Wethersfield join Hand on that side of the bracket and will have something to say about the Tigers’ hopes of three-in-a-row. Glastonbury in Class LL is the last school to win three-straight state titles, taking home crowns from 2013-15. There have been calls to move schools of choice out of the lowest divisions but for now, they remain. To be fair, unlike basketball where private schools dominated in Class S, the public schools are doing just fine playing against small private schools in the state tournament in recent years. In fact, Kolbe Cathedral in 2007 is the last school of choice to win Class S as the public schools have remained in control on the soccer pitch. We will see if a team like No. 9 Notre Dame-Fairfield or No. 23 Immaculate can win one for the private schools and reignite the debate. Granby Memorial was one of the most decorated teams in Class S, winning 12 titles with the last coming in 2005. Playing in Class M has proven to be tougher sledding though Granby reached finals in 2008, 09 and 11. Last year as the No. 1 seed they were ousted in the quarterfinals and a year before that lost in double overtime in the semifinals as the No. 2 seed. They come in this year as the No. 2 seed with their eyes on the prize and what they hope will end in their first Class M championship.